A tree has been planted in memoriam of the city’s first ever female Asian councillor and former Lady Mayoress, Meto Lakha. Meto Lakha passed away in February 2012. She made history in Coventry when she became the first female Asian councillor in May 1992 and she was also the city’s first Asian Deputy Lady Mayoress of Coventry City Council in 2004. The tree was planted near the junction of Binley Road and Brays Lane on Saturday (2 February). 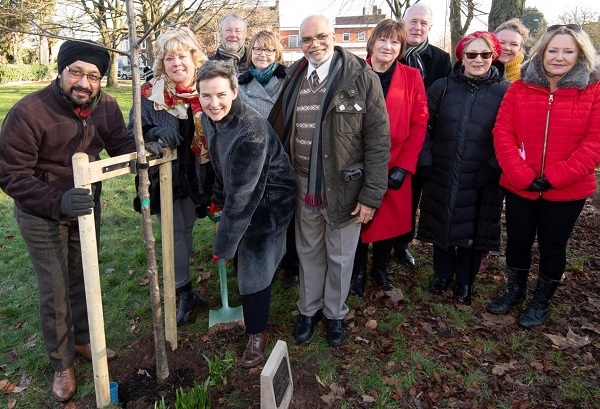 The ceremonial tree planting was also attended by Coventry-raised Mary Creagh MP, Chair of the Environment Audit Committee; Colleen Fletcher MP; the Council Leader, George Duggins and numerous Coventry City Councillors.